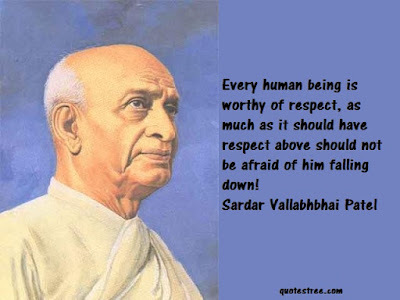 Sardar Vallabhbhai Patel (October 31, 1875 - December 15, 1950), popularly known as Iron Man was an Indian barrister and statesman and one of the founding fathers of India Republic. Here I have compiled down some of the best Sardar Vallabhbhai Patel quotes, sayings and slogans. Just hope you will like this quote compilation and learn something inspirational from the words of Sardar Vallabhbhai Patel. Every human being is worthy of respect, as much as it should have respect above should not be afraid of him falling down! Everything in life do not go one day! Complain is the work of cowards! Braves took over the task of preparing the way! Eager enthusiasm should not have expected to yield big results! We must learn to endure humiliation! No one would die of starvation in independent India. Its grain would not be exported. Cloth would not be imported by it. Its leaders would neither use a foreign language nor rule from a remote place 7,000 feet above sea level. Its military expenditure would not be heavy. Its army would not subjugate its own people or other lands. Its best-paid officials would not earn a great deal more than its lowest-paid servants. And finding justice in it would be neither costly nor difficult." If Hyderabad does not see the writing on the wall, it goes the way Junagadh has gone. Pakistan attempted to set off Kashmir against Junagadh. When we raised the question of settlement in a democratic way, they (Pakistan) at once told us that they would consider it if we applied that policy to Kashmir. Our reply was that we would agree to Kashmir if they agreed to Hyderabad. The Governor of Burma boasts in London that they left Burma only after reducing everything to dust. So you promise the same thing to India? ... You refer in your radio broadcasts and newspapers to the government established in Burma by Japan as a puppet government? What sort of government do you have in Delhi now?...When France fell before the Nazi onslaught, in the midst of total war, Mr. Churchill offered union with England to the French. That was indeed a stroke of inspired statesmanship. But when it comes to India? Oh no! Constitutional changes in the midst of a war? Absolutely unthinkable ... The object this time is to free India before the Japanese can come and be ready to fight them if they come. They will round up the leaders, round up all. Then it will be the duty of every Indian to put forth his utmost effort—within non-violence. No source is to be left untapped; no weapon untried. This is going to be the opportunity of a lifetime.